So, apparently, people don’t think poetry is cool. Guest edited by Debra J. Dickerson with Gerald Early as the series editor, the anthlogy presents essays on everything from Jamaica Kincaids thoughts on Daffodils to Mark Anthony Neals meditation on pain’s place in music. Yes, the writers are African-American. Yes, some of the essays deal with “race” as an issue. But much like News & Notes, the anthology recognizes that black folks have a LOT to talk about. 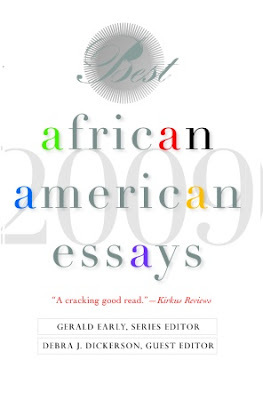 If you would like to be reminded that there really is a myriad of contemporary black essayists – buy this book immediately. If you would like to be believe there is such a thing as “one black voice” – buy this book immediately and be proven wrong. I’ll be honest. The above picture really has no relation to anything in this post. I saw it the other day and am still creeped out. I don’t want to suffer alone. Look at it and join me in horror. On the bright side, any and all references to Dubya’s kisses are past tense. Kudos to the city of Montclair for making a bid to save the Dodge Poetry Festival! In January, the foundation announced it would not present the 2010 festival because the recent market meltdown caused its net assets to drop by one-third, to about $210 million. My father first came to Death Valley because Charles Manson told him to. He always did what Charlie said; that was what it meant to be in The Family.